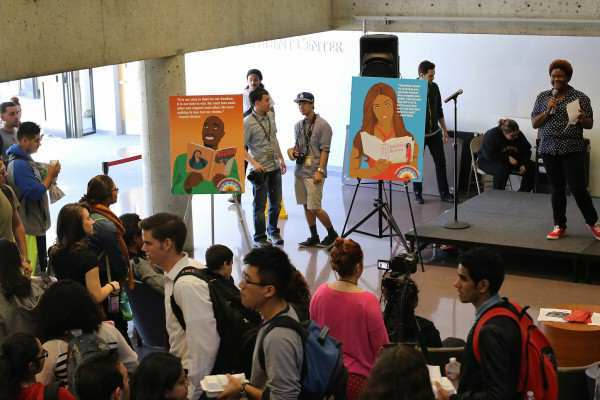 SF State, an institution that prides itself on free speech and personal expression, is celebrating those values by hosting many events this week and applauding works of literature that have challenged the status quo. From Sept. 21-27, readers celebrate the freedom to read and honor books that have created controversy, been banned in schools and used in book burnings during National Banned Books Week. The University participated with an event Thursday to honor these works, one of which was written by a former SF State professor. 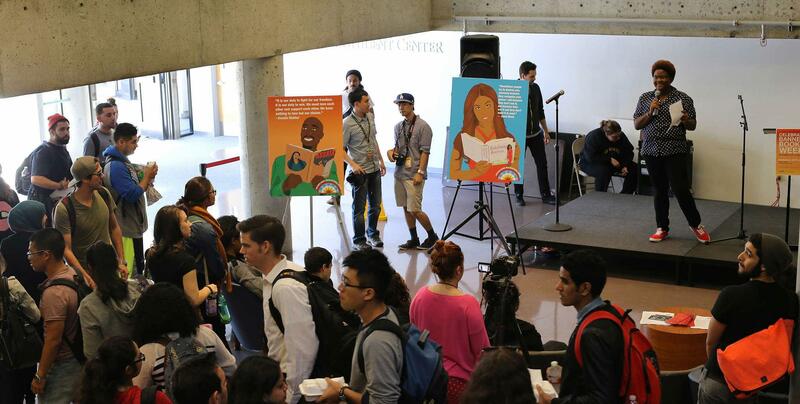 Host Imani Cezanne recites a formerly banned poem during Banned Books week in the Cesar Chavez Student Center Thursday, Sept. 25, 2014. Ryan Leibrich / Xpress. Gloria Anzaldua, who died in 2004, wrote the 1987 book “Borderlands/ La Frontera: The New Mestiza,” a semi-autobiographical work that detailed her experiences growing up in Texas and coming to terms with her sexual identity. Deziree Miller, a Latino studies major, and Jacqueline Gutierrez, a sociology and Latino studies major, read a passage together from “Borderlands” at the event Thursday. They expressed their admiration for Anzaldua and the influence her writing has had on them. The book was recently banned in Arizona under the 2010 House Bill 2281, and upheld by an Arizonian court in 2013. The bill prohibits the teaching of courses that “promotes the overthrow of the United States government or promotes resentment toward a race or a class of people,” according to the official bill summary. As well as celebrating Anzaldua’s works, the Richard Oakes Multicultural Center celebrated authors such as Maya Angelu, Rudolfo Anaya and others at the event last week. 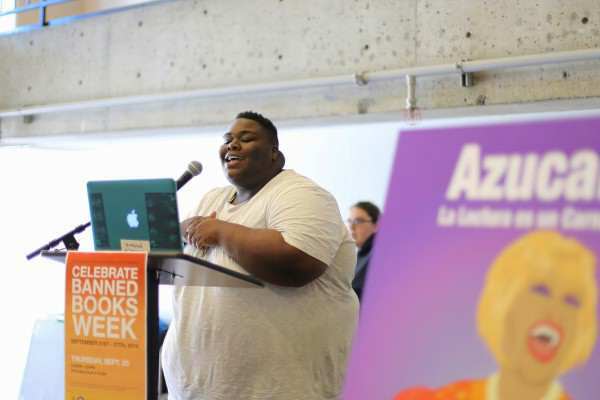 Imani Cezanne, an Africana studies and communications major, hosted the event on the plaza level of the Cesar Chavez Student Center with high energy, pumping up the crowd every time she came up to introduce a new speaker. Students signed up and read passages from controversial texts of their own choosing or from a selection the student center had on hand. Cezanne spoke as well, reading two original poems and discussed the importance of banned works of literature. Students from S.P.E.A.K., a student-run organization that promotes spoken word, also attended the event to read their original works of poetry. One member was Jari Bradley, a sociology major who read two personal and passionate poems to the audience. 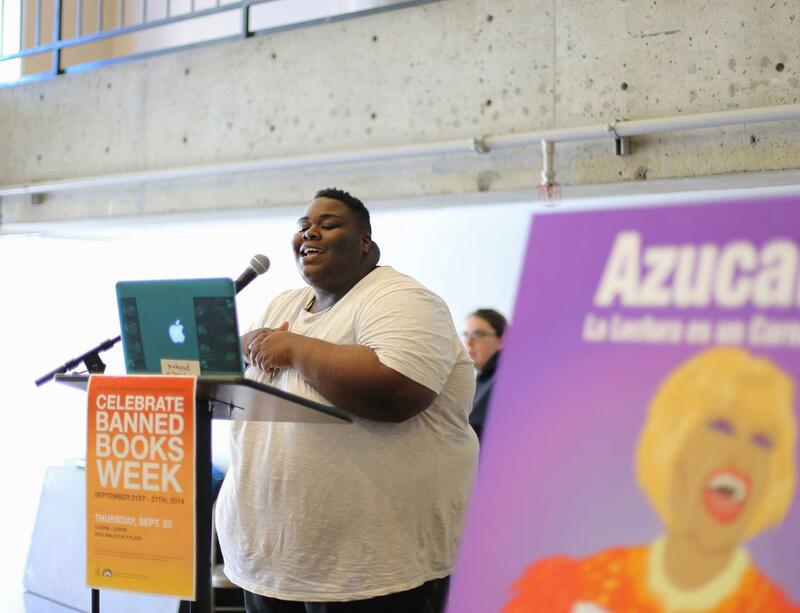 “The life I live as a woman of color, who is queer and (a member of the) working class, charges the work I do,” Bradley said following her readings. Along with the display of literature, a screening was delivered of “Precious Knowledge,” a documentary about Arizona House Bill 2281. The passing of the bill caused the shutdown of the Tucson Unified School District’s Mexican-American studies program, the only program to be disassembled, and the removal of several award-winning books, including Anzaldua’s “Borderlands,” from school curriculum, according to Roque Planas of the Huffington Post. Opponents of the bill feel that it unfairly targets people of Latino heritage, while proponents argue that because the books are still available in the school libraries, the bill does not violate free speech. For Cezanne, the restrictions only encourage her more. For a list of frequently challenged books from past years, visit the American Library Association’s website.